Action: Choose and destroy a Location support card. Then, put Dhole Attack! into play as a Monster character with 3 skill and (T)(T)(C)(C). 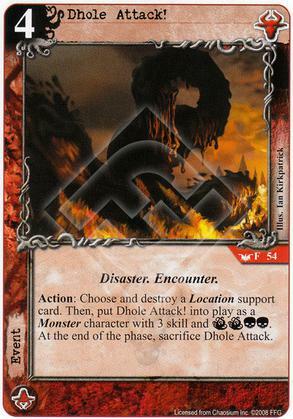 At the end of the phase, sacrifice Dhole Attack. I love ambush cards but I have trouble even liking this card. An ambush card that isn't repeatable or leave a character in play has limited use. Cost 4 is steep and by the time you can afford it the character may not be strong enough to stand up to your opponent's characters. The ability to destroy a location is a trap, it makes you think this card will do double the work but it will instead prevent you from playing the event in most games. I'll give this card a miss. Sadly most supports I want to destroy are not locations (Temple of Ry'leh is one big exception), except maybe my own. Cost 4 is high, and not worth it for the character alone. Give me a cheaper character with those icons that lasts, and a cheaper support destruction and I'm happier. Shub generally has these things. I would love this card if it didn't cost so much. It seems like it wouldn't be out of line to make it unrestricted on the types of Support cards it can destroy for the cost. If your opponent sees you sitting there with an open 4-resource domain and a card in your hand, he's going to know something is up. That's especially true if he saw you resource this early in the game (as will often happen). For that reason, I suspect this card would be just as useful on offense, and that's not saying much. As mulletcheese implies, this would be a much better card if it didn't use the word "then". Because it does, you only get the instant monster effect if you can destroy a location. Basically, including this card requires either gambling that your opponent has a Location, or being willing to play and destroy your own Location. Neither of those is attractive and the result is the card is almost unplayable.